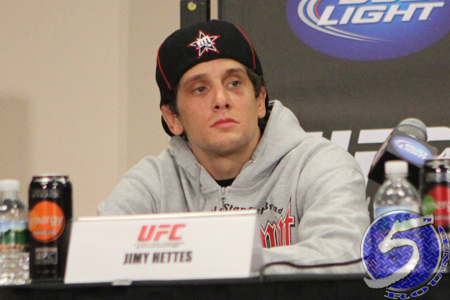 On Tuesday, a featherweight tilt between Jimy Hettes (pictured) and Diego Brandao was added to UFC 183. UFC officials announced the scrap via Twitter. The January 31 event takes place at a yet-to-be determined venue in Las Vegas, Nevada. Both 145-pounders are looking to bounce back from losses – Brandao is coming back from two straight defeats. After kicking off his professional career with a perfect 10-0 mark, Hettes has now dropped two of his last three. “The Kid” most recently was TKO’d by Dennis Bermudez at UFC 171. Brandao, meanwhile, could be fighting for his UFC life, but probably isn’t. “The Ultimate Fighter 14” winner has posted back-to-back first round losses to Conor McGregor and Dustin Poirier.